Check out our review of the Bose Soundtouch 20 speakers. Update: We incorrectly stated that the software updates occur automatically behind-the-scenes. Bose told us that the user will be required to activate the software updates via the SoundTouch app. The story has been amended to reflect this change. Recognizing that more and more consumers are pulling their music from the Internet, premium audio maker Bose is introducing its new Wi-Fi-based wireless music ecosystem called SoundTouch. Any Bose equipment that supports SoundTouch can access music stored on a Mac or Windows computer (using the DLNA protocol), as well as Internet and Pandora radio stations. “It’s more than a new product intro, but more about how you enjoy music at home,” the company said. Compared to similar products already available, Bose said there are things they think they can do better. Besides music streaming, SoundTouch-based devices can be controlled via the Bose SoundTouch app for iOS, Android, Mac OS X, and Windows. With this app, you can browse for music; set up to six presets for one-touch access to a specific playlist, Internet radio station, or Pandora station; and, if you have multiple SoundTouch devices, control volume and music selection on a particular device, or set all devices to play simultaneously as a multi-room system. Bose has also added support for Apple’s AirPlay that lets you send audio from the latest iOS and OS X operating systems. At launch Bose is debuting three new systems: the SoundTouch 30 ($699), SoundTouch 20 ($399), and SoundTouch Portable ($399). All three are designed just for music streaming over Wi-Fi, so don’t expect a traditional radio or CD player inside. The SoundTouch 30 is the largest unit, designed to serve as the main sound system in a room and uses Bose’s proprietary waveguide tech and woofer. The SoundTouch 20 is a compact unit that can be moved from room to room if needed, while the Portable is for use as its name implies. The SoundTouch 30 and Portable use existing architecture found in previous Bose products, but Bose told us that they had to reengineer for the SoundTouch 20 in order to get big sound out of a smaller unit – to get it as close to the SoundTouch 30 as possible. Bose thinks the SoundTouch 20 will be the most attractive with users. Like nearly all Bose products, all three speakers are designed for easy Wi-Fi setup and use, and the SoundTouch app detects any speaker on the network automatically. When a software update is available, the app will alert the user, who then simply pushes an “OK” button. A display on the front shows you what’s playing, and at the top are the six preset buttons that correspond to the six presets you establish via the app. Each unit will come with a simple remote control, but more advanced options will require using the app. 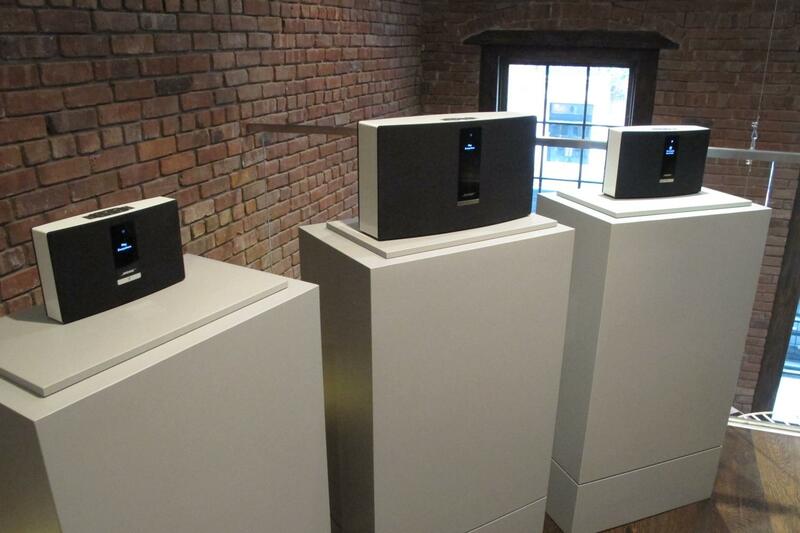 The three speakers are just the first, as Bose will be rolling out more SoundTouch devices in December and into 2014. A Wave SoundTouch music system ($599) is next, followed by the SoundTouch Jewel Cube system ($1,199), an amplifier ($499) for select Bose products, and a wireless adapter for its Lifestyle and VideoWave products. There will also be a SoundTouch controller, an optional circular remote with an OLED screen and basic function buttons that can be placed on a wall; the idea is you can enter your home, hit a preset button on the controller, and start playing tunes. We had an opportunity to try out the SoundTouch during a press preview. 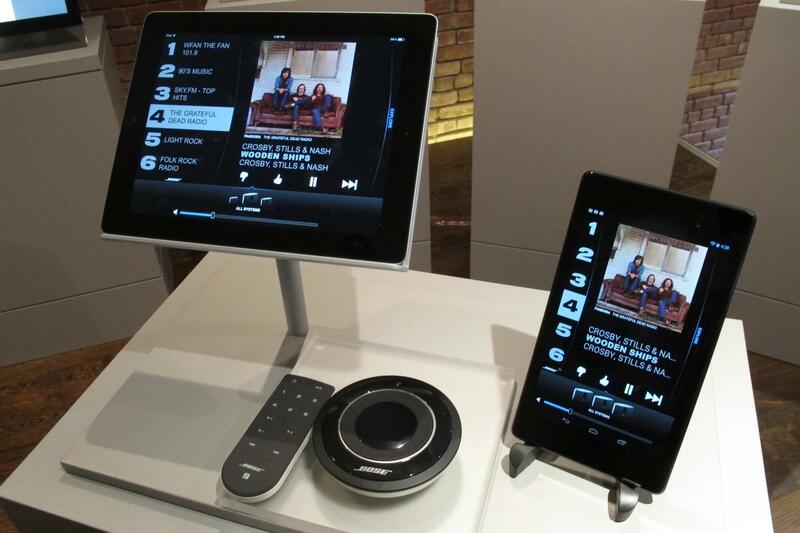 Like most Bose products, the devices are easy to operate, as is the SoundTouch app. To assign a preset station, you simply browse and pick something from Pandora, Internet radio, or music playlist, and hold down on the preset or drag-and-drop the music source onto the present. Once you’ve determined the presets, you can hit 1 to 6 on the unit itself or remote control and it’ll jump to that source. The music starts playing fairly quickly, although there will be delays if there’s any Internet lag – we tried tuning into BBC Radio 1 in the U.K. and there was an almost 10-second delay before music started playing. The app is barebones at the moment, so navigating around is intuitive; a software update will arrive sometime in December that will see more options added. As for sound quality, music filled the room warmly with very clear vocals and good bass levels. The sound was particularly impressive from the smaller SoundTouch 20. If this kind of wireless music technology sounds familiar, it’s because it has already existed for years, from other manufacturers like Sonos, Logitech, and Samsung. Bose acknowledges that and doesn’t claim to be reinventing the wheel. What is different, Bose says, is its focus toward “effortless” ease of use. They aren’t complicated to set up, and playing a song is a one-touch process. The effortless design revolves around the six preset buttons that lets you near-instantly access your favorites. This approach mirrors Bose’s philosophy for all of its products, focusing on simplicity rather than overloading products with features. But the simple design has its issues. Bose’s products tend to be so streamlined and singularly focused that they get locked down with no expansion potential. Take the six presets: With all the available music that’s available to the SoundTouch system, forcing people to choose only six at one time seems too restrictive. When we pointed this out to Phil Hess, Bose’s vice president for its home entertainment division, he told us that they actually struggled on that during the SoundTouch’s three-year development, before deciding on six. Part of the decision is based on ease of use, while another is the familiar concept people have from older car radios. “For the first generation, we just want to hit the simple targets and get them right at launch,” Hess said. “Six is standard, but if there’s something better or if customers request for more, we’ll pick a different number.” Citing the system’s ability to update the software in both the speakers and the app, the six presets aren’t set in stone. And, the number of music sources will also grow, as well as the ability to add multiple users and provide more control over the speakers, and possibly even new hardware like music servers or CD changers if that’s what its customers want.